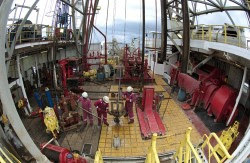 The Integrated Ocean Drilling Program (IODP) is an international marine research program that explores Earth's history and structure recorded in seafloor sediments and rocks, and monitors subseafloor environments. IODP builds upon the earlier successes of the Deep Sea Drilling Project (DSDP) and Ocean Drilling Program (ODP), which revolutionized our view of Earth history and global processes through ocean basin exploration. Geology.com publishes a story about the Costa Rica Seismogenesis Project (CRISP) expedition carried out by the scientific drilling vessel JOIDES Resolution, and the nearly 1,500 m of sediments collected from the ocean floor off the coast of Costa Rica, revealing records of some two million years of tectonic activity along a seismic plate boundary. 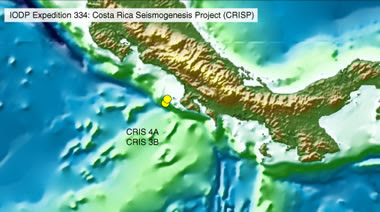 The CRISP research site is located 174 km (108 miles) off Costa Rica. IODP image. I'm pretty sure that the crews if the vessel also undergo to another rigging training to also fit in with the new drilling program the whole ship is undergoing to. Also I do appreciate all the efforts in ocean exploration to be able to learn more about the tectonic activities beneath the ocean. Surely this action will affect the overall pricing of oil in the market. No matter what, I think, it is always better top put the condition of majority rather than considering what will benefit on organization or corporation. My thoughts about the oil drilling processes is that, they better stop searching for oil wells and start promoting eco-friendly vehicles. Besides, this kind of vehicles was said to be easier to maintain and is way way better when it comes to performance.